Five things worth knowing this week . . .
Papermaking Pizzazz. 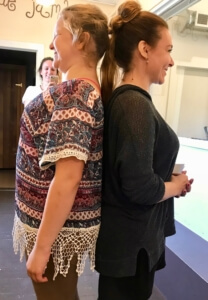 The person who has more fun than the rest of us combined, Caroline Rockey, has this week been leading a crew of intrepid young artists in a fabulous exploration of paper and all the ways it can be used. Her students have been learning how to make paper from scratch, using pulp and watercolor for dye. They’ve worked on 3D pop-up paper sculptures. They’ve made kites. They’ve woven, folded, pasted, painted, printed, drawn, and surely quartered the stuff into a veritable concert of paperness. In between papermaking madness, they have run laps around the Blue Heron at full speed—giggling and generally getting every last ounce out of their summer hours. Speaking of that, they close out our amazing action-packed summer season of camps this Friday! Thank you to all the staff and students who have made this a summer for the memory books. The kites they decorated Thursday might just make an appearance in the upcoming production of Mary Poppins. You’ll have to come see for yourself to know for sure! Goodbye Summer Arts Fest . . . Until Next Summer! We closed out our first annual Vashon Summer Arts Fest (and yes there will be a second one) with an artist pot luck that was the whole thing in a nutshell . . . a wonderful gathering of Vashon artists enjoying each other’s company and sharing good words, feelings, and food. Total of 117 Vashon Artists in the Summer Arts Fest !! But the numbers are only part of the story. One of the great chapters in this story was managing the titanic volume of art and displaying art that Devin Grim managed these past two months. Those 117 artists brought a ton of 2D and 3D goodness to our building, every single piece of which needed to be stewarded from car to its final display space. Some of those pieces were easily “one-handed” and some required pallet jacks. The idea that we would turn our gallery every week for two months is shear madness, an undertaking Devin has handled with style and great good cheer. Simply astounding. Promoting this enterprise was yet another tale of pluck and hard work. Between Joe Panzetta, me, show producer Lynann Politte, Shauna Ahern, Micole McCarthy, and Juli Morser, we have written countless press releases, articles, calendar holds, Facebook invites, group emails, email blasts, blog posts, posters, post cards, invitations and more. Photos have been taken, processed, and placed on Facebook, Instagram, our Blog, and Vashon’s newspaper of record. We’ve printed posters, show notes, show cards, invitations, rack cards, and more. And thank you to our partners at Voice of Vashon for producing so many fabulous PSAs! We have held our gallery/lobby open every Friday and all weekends since we first opened the Festival. This has placed a significant load on our front-of-house crew to greet visitors, serve refreshments and beverages, manage crowds, and yes SELL ART! We’re waiting on the final numbers but I can tell you right now we’ve done well. The bonus event, and another piece of sheer lunacy, was the scramble to set up for and manage Concert-in-the-park-in-the-Kay with the Paperboys. And yet again, the team rallied. Thank you Devin, Justin, Ele, Lisa, Mallory, Angela, Ben, and Ethan for pulling together so many times to make the guest experience a great one. Organizing the project landed on Lynann Politte’s shoulders, with lots of collaboration from Joe, Micole, Devin, and Angela. The level of planning and coordination that went into this is as big and hairy as you imagine and we pulled it off with very few hitches and none that mattered in the end. Brilliant. Thank you Lynann, Joe, Micole, Devin,and Angela. Early in this process I went to Beth and John de Groen at Windermere Real Estate. Keep in mind that I was about six weeks into the job and still trying to figure out where all the light switches were. I laid out the idea and Beth was kind enough to say, “We’re in” about ten seconds into my pitch. The money was important for sure, but the love, support, and encouragement was all that and more. Thank you Beth and John. In the end, the biggest helping of gratitude goes to those 117 artists and curators who took the giant leap of faith with us with little more than an idea, a promise, and a plea to go on. The outpouring of support, interest, enthusiasm, and brilliant art is a resounding testimony to the power of a good idea, what happens when one proceeds out of love, and the depth of talent on this island. It has not escaped anyone’s attention that this celebration of art and artists on Vashon has helped us collectively heal some of the hurt and alienation many folks were feeling. Thank you to everyone who leaned in to help us all move forward together. Smoke On the Waters. 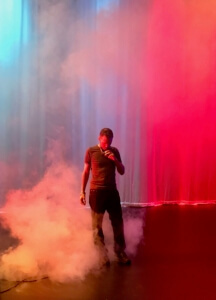 File this under the category of “Don’t Ask.” The fire alarm kept sounding today which caused me to vaguely recall an email last night about “testing a fog machine.” Apparently we have one and it works. Boys will be boys. More wood goodness. I just can’t leave this alone. “Slabs as Art” has been an aesthetic triumph. David Warren has brought us an amazing collection of giant slabs which will be in our lobby for just one more day. One is staying behind forever as part of our next community project, “Vashon’s Coffee Table.” More on that to come. First Pointe Shoes. I think these pictures say it all. 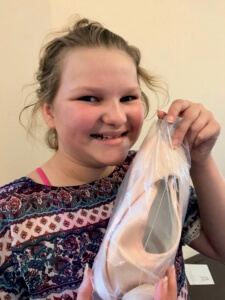 Someone is pretty darned happy to get her first set of Pointe Shoes. Finally, and this is a sixth thing . . . We’re getting super excited about the upcoming Sweet Dreams, The Music of Patsy Cline concert on Sept 29. Her list of greatest hits reads like a catalog of some of the best songs of the past 50 years. Just because it’s my blog, here are three of my favorite Patsy songs with some intriguing covers. Enjoy! Of course we start with Crazy, by Willie Nelson . . .
“I Fall to Pieces” was written by Hank Cochran and Harlan Howard and was first pitched to Brenda Lee and Roy Drusky. Both stars declined. Indeed, it is reported that when Patsy Cline first heard it, she “detested it.” It is arguably her greatest hit.
. . . and this version from Aaron Neville and Trisha Yearwood. I have listened to a ton of covers and still prefer Patsy’s, but this is fun. Alan Block and Donn Hecht wrote my third pick, “Walkin’ After Midnight.” In what seems like a recurring theme, the song was originally given to pop singer Kay Starr, however, her label rejected it. And true to form, Ms. Cline did not love it when she first heard it, but finally agreed to record it.
. . . I think Kelly Clarkson does a pretty smoking cover of it. Why “Fish Wrap”? Years ago, living in San Francisco, I became a devotee of a legendary journalists named Herb Caen. While he may not have been the first to use the phrase in connection with “yesterday’s news,” he is the one I remember. Today’s news is tomorrow’s fish wrap. Maybe it’s a generational thing. At any rate, we call our Friday wrap up, The Friday Fish Wrap . . . Five things worth knowing about VCA this Friday.